Local dignitaries and construction partners have celebrated work officially commencing at a new £120 million business park in Worcester. Development partners Stoford and Liberty Property Trust were joined by Gary Woodman, Worcestershire Local Enterprise Partnership, Cllr Linda Robinson, Wychavon Distirct Council, Cllr Ken Pollock, Worcestershire County Council and Cllr Geoff Williams, Worcester City Council at the official launch of work on the 178 acre site. 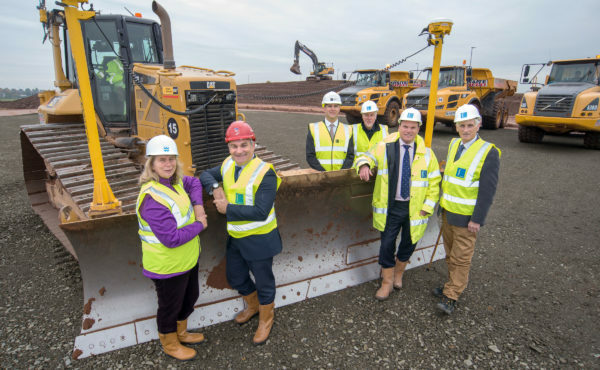 Stoford director Gerard Ludlow said: “We’re delighted to have been able to celebrate the start of construction of the first units at Worcester Six with our development partners Liberty Property Trust and Worcestershire County Council and Wychavon District Council. “Worcester Six is the first large-scale development in Worcester for 10 years and brings with it considerable investment in the area and opportunities for growth. With work now starting we’re on target for a summer 2017 completion.